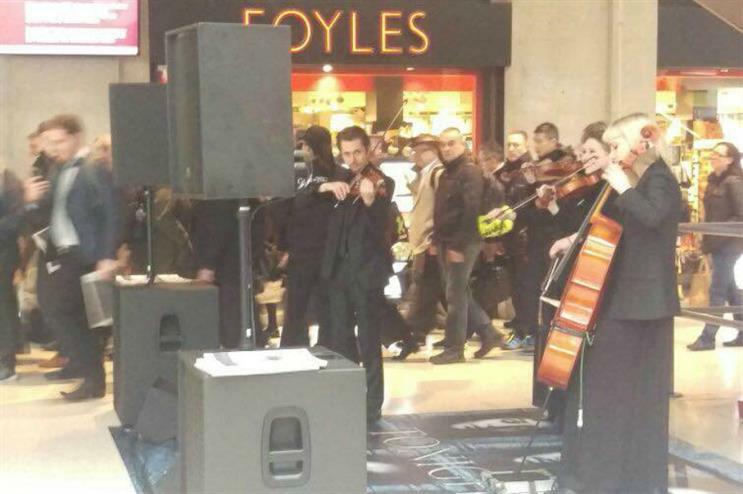 Sky Atlantic has landed an orchestra within London's Waterloo and Liverpool Street stations today (25 April), to mark Game of Thrones' return to the channel. Using violins and a cello, each of the two four-piece bands can be heard playing the programme’s iconic theme song throughout both stations. The musicians are dressed in black, and both performance spaces feature Game of Thrones poster on the floor beneath them. The performances have stopped commuters in their tracks this morning, and they are expected to continue throughout the day. Those who are unable to make it to either station are invited to tune in via Periscope. The season six premiere of Game of Thrones airs on Sky Atlantic at 9pm tonight (25 April). Last month saw Sky Atlantic enlist artist Simon Beck to create a snow mural in the French alps, in a bid to promote the impending return of the programme.